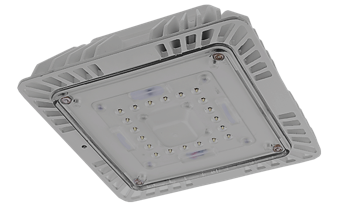 The Aleo LPC Series LED Canopy combines energy-efficiency, advanced optical control, and modern slim profile aesthetics to deliver enhanced performance to parking garage and parking structure applications. Ideal for environments seeking higher light levels and improved safety. Rugged die-cast housing provides advanced thermal management for long life and weather-proof compartment to withstand challenging environments. Parking garages, parking structures, drive-ways. This Garage LED Canopy has Rugged, die-cast housing with advanced thermal management system ensures reliability and durability. Weather-proof, gasketed driver compartment protects electronics against environmental elements. 5-year Limited Warranty. See warranty documentation for more information. This LED Canopy Luminaire utilizes high-efficacy LED packages maintained at cool temperatures for long life, high efficacy. Reliable driver features universal voltage (120-277V) for convenient installation. Luminaire comes standard with mounting plate for quick and easy installation.